Since version 3.1, Godot supports ragdoll physics. Ragdolls rely on physics simulation to create realistic procedural animation. They are used for death animations in many games. In this tutorial, we will be using the Platformer3D demo to set up a ragdoll. You can download the Platformer3D demo on GitHub or using the Asset Library. 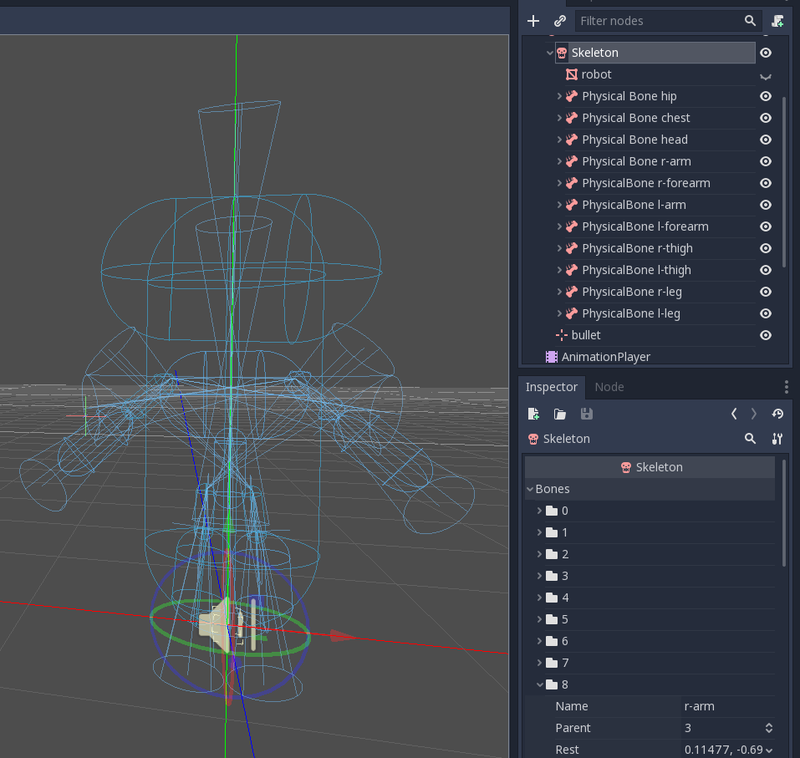 Like many other features in the engine, there is a node to set up a ragdoll: the PhysicalBone node. 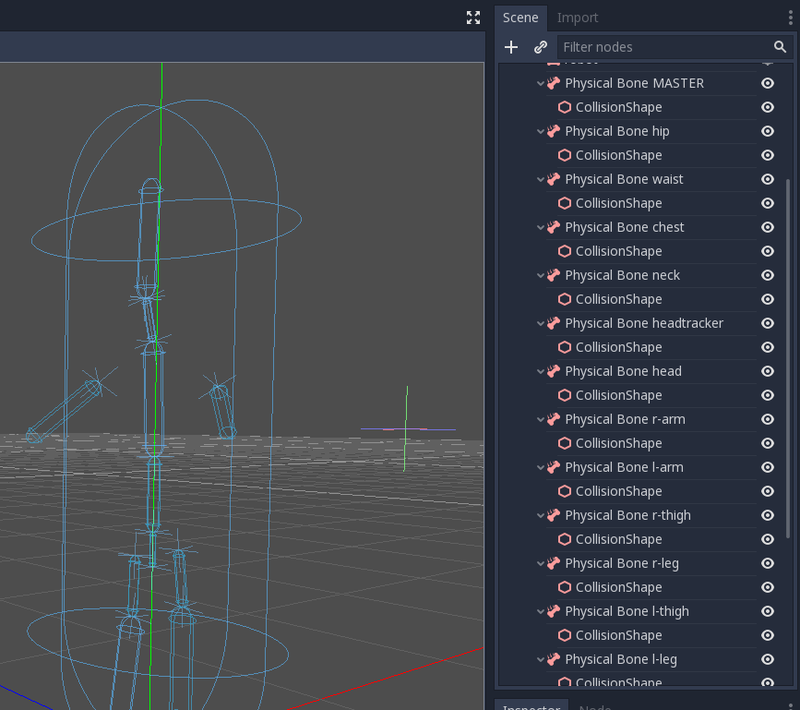 To simplify the setup, you can generate PhysicalBone nodes with the "Create physical skeleton" feature in the skeleton node. Some of the generated bones aren't necessary: the MASTER bone for example. So we're going to clean up the skeleton by removing them. Each PhysicalBone the engine needs to simulate has a performance cost, so you want to remove every bone that is too small to make a difference in the simulation, as well as all utility bones. For example, if we take a humanoid, you do not want to have physical bones for each finger. you can use a single bone for the entire hand instead, or one for the palm, one for the thumb, and a last one for the other four fingers. Remove these physical bones : MASTER, waist, neck, headtracker. This gives us an optimized skeleton and makes it easier to control the ragdoll. The next task is adjusting the collision shape and the size of physical bones to match the part of the body that each bone should simulate. Once you adjusted the collision shapes, your ragdoll is almost ready. You just want to adjust the pin joints to get a better simulation. PhysicalBone nodes have an unconstrained pin joint assigned to them by default. To change the pin joint, select the PhysicalBone and change the constraint type in the Joint section. There, you can change the constraint's orientation and its limits. To stop the simulation, call the physical_bones_stop_simulation() method.